There wasn't a whole lot to today's action. The coiling action unwound with a relatively unconvincing push down. 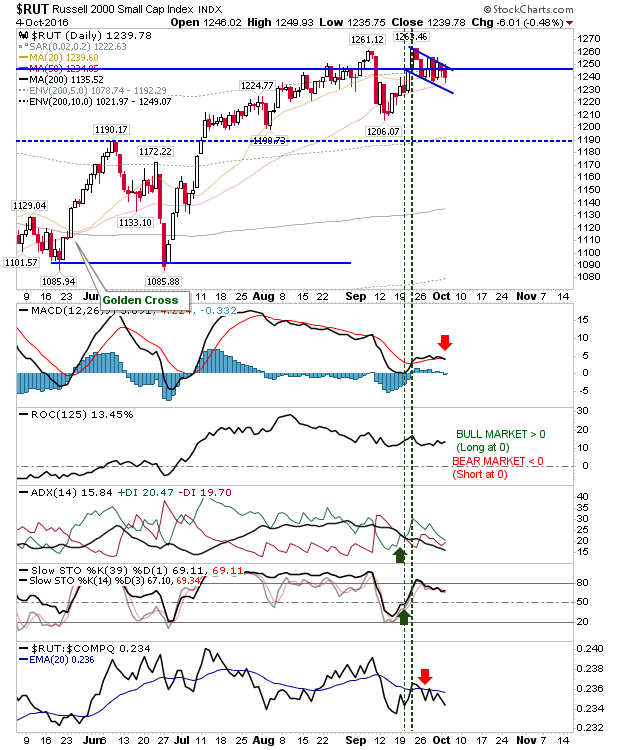 There was no significant break of support or move out of prior consolidations for major indices. Volume climbed in confirmed distribution. The S&P is resting on rising support having edged an intraday break of such support. 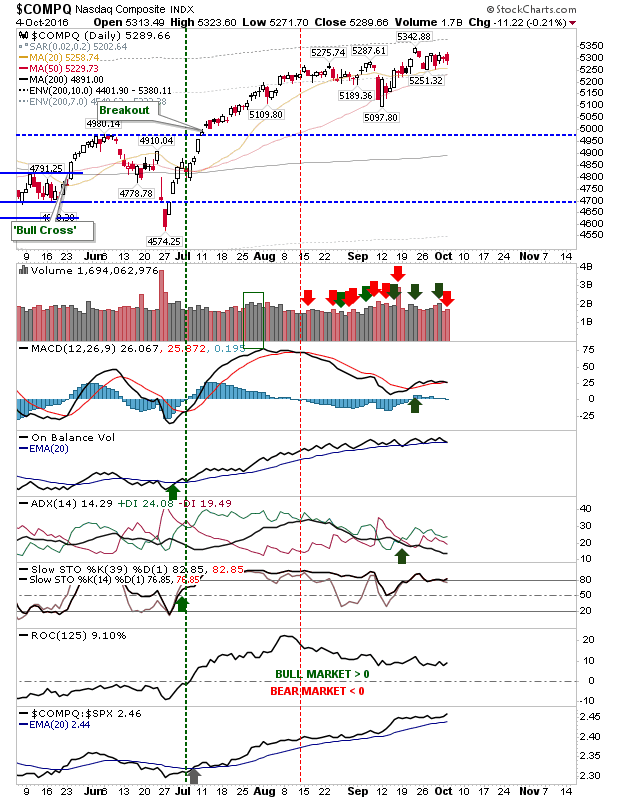 Technicals are as they were yesterday with a 'buy' in Stochastics and MACD and a 'sell' in On-Balance-Volume and Directional Indicator. The Nasdaq actually closed with a bearish engulfing pattern on yesterday's inside day. Technicals are all net bullish, although weakening, and it too clocked up a distribution day. The Russell 2000 is still playing a bullish 'flag' despite today's loss. Look for the bounce off the 50-day MA as an opportunity for bulls to launch an attack on bull 'flag' resistance. 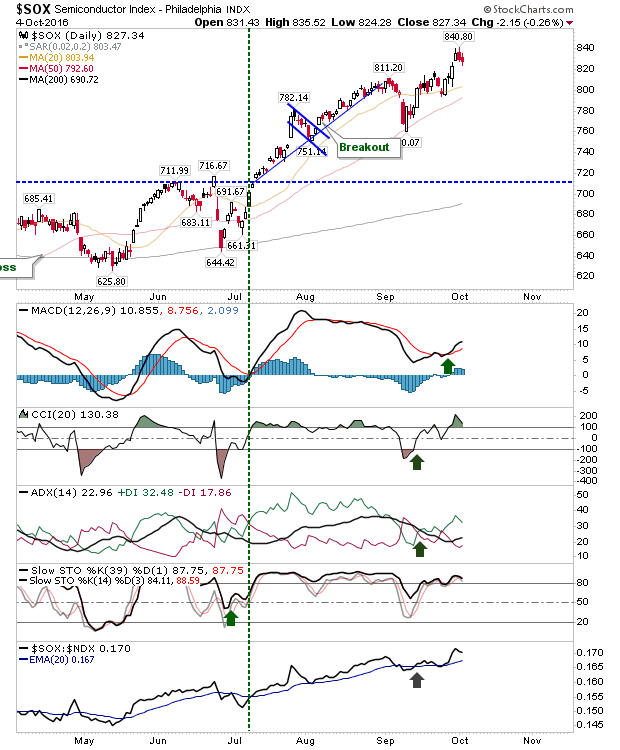 However, the MACD trigger 'sell' is a warning sign for possible failure, along with the relative underperformance of the index to the Nasdaq. The Semiconductor Index is the performance leader with today's losses hanging near recent 52-week highs. 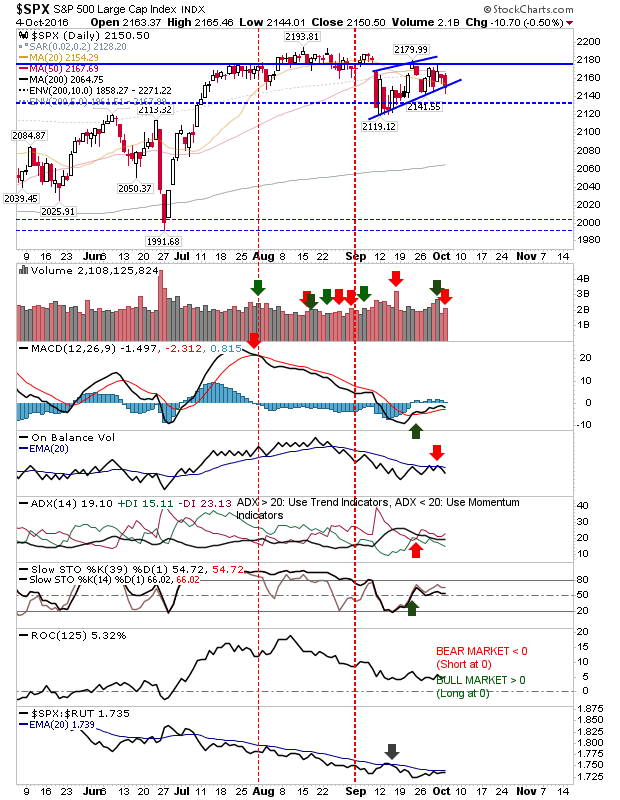 Technicals are in good shape with indicators net bullish. The index is holding above all lead moving averages and is outperforming the Nasdaq 100. For tomorrow it will likely be more of the same. Watch for selling activity to push markets out of their consolidations and bring shorts into play. Bulls will probably need a 2-bar reversal, where tomorrow's close is near today's highs to undo today's bearish edge.